Penny Poison is performing at Sunset Strip Exit 69, today through March 22, in Portland, Oregon. Penny Poison is performing at Kandys Adult Playground, today through March 16, in Waterford, Pennsylvania. Penny Poison is doing Penny_Poison cam shows today. Penny Poison is performing at Deja Vu with Sassee Cassee, today through January 12, in Lexington, Kentucky. Penny Poison is performing at Goldfingers Ultimate Entertainer Awards Show today through October 28, in Sunrise, Florida with Callie Jane, Katie Sutra, Ivy Bane, Shar Zayne, Trinity Turner and more. 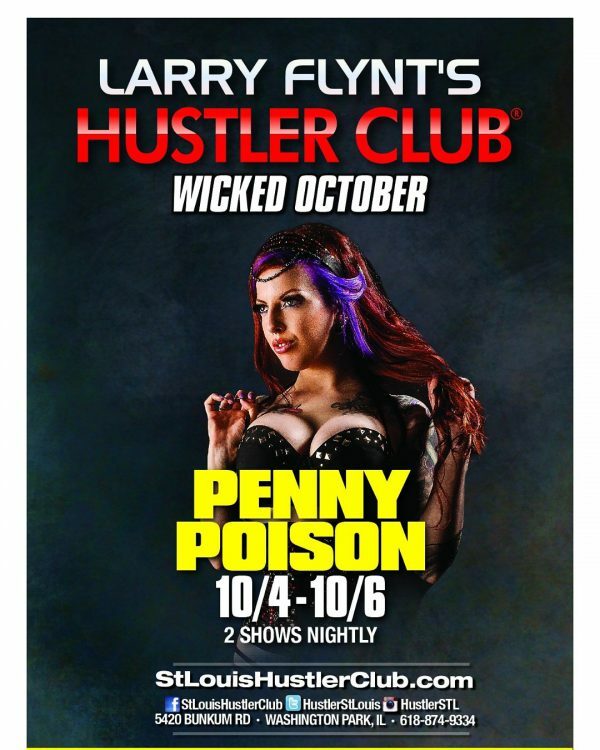 Penny Poison is performing at Hustler Club St Louis today through October 6, in Washington Park, Illinois. Penny Poison is performing at The Gold Club today through March 17, in Memphis, Tennessee. Penny Poison posted to Blue Blood VIP in a set by yours truly and Forrest Black called Three Way Speculum. Penny Poison is performing at andy’s Adult Playground today through February 17, in Waterton, Pennsylvania.